In the early hours of Friday 27th May 2017 a large storm rapidly formed over Devon and Cornwall, as part of an approaching front. 200km away in Wiltshire the sky was still clear and as usual the Wilcot station meteorcams were monitoring the sky for brief flashes of light from meteors. A few meteors were captured but mostly the meteorcams picked up the flashes of distant lightning. By the end of the night lightning had triggered the west facing camera more than 600 times. Thunderstorms this strong aren’t very common in the UK and it shows up on the satellite image below as an intense white blob over the southwest tip of England. In addition to the usual flashes along the horizon there were brief flashes of ghostly sprites, far above the storms and almost at the edge of space. These discharges lasted barely a tenth of a second but were bright enough to trigger the camera. It was a record night for sprites from this station with 23 events being recorded before the advancing cloud blocked out the night sky. Lightning occurs in the lower 10km of the atmosphere but sprites are typically 60 to 90km above the surface, just below where most meteors burn up. 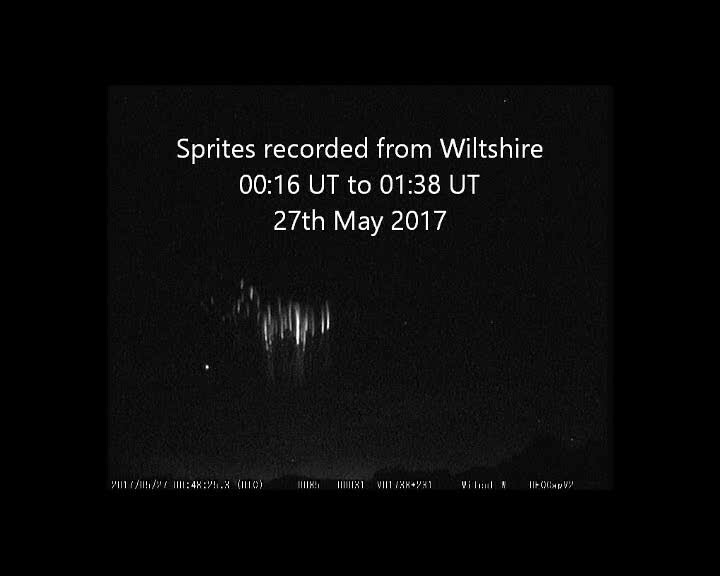 Sprites, or Transient Luminous Events (TLE), are very different to lightning near the ground and several forms were recorded during the display. Here is a compilation of all the sprites recorded during the night. Note the distinctive little spots below each spike. Even the International Space Station put in an appearance during one of the sprite events. The ISS moved during the few seconds the camera was recording, leaving a bright streak). The more easterly part of the storm front was also moving northward and swept overhead at dawn, heralded by thunder and lightning. The brief wall of rain was preceded by a good display of mammatus clouds. The video is a compilation of all the events triggered during the night on the south-west facing camera, with several flashes a minute at some stages. Lightning progression on the morning of 27th May 2017. The images indicate the route the storm took and how it intensified. The video is looking West from Exmouth. 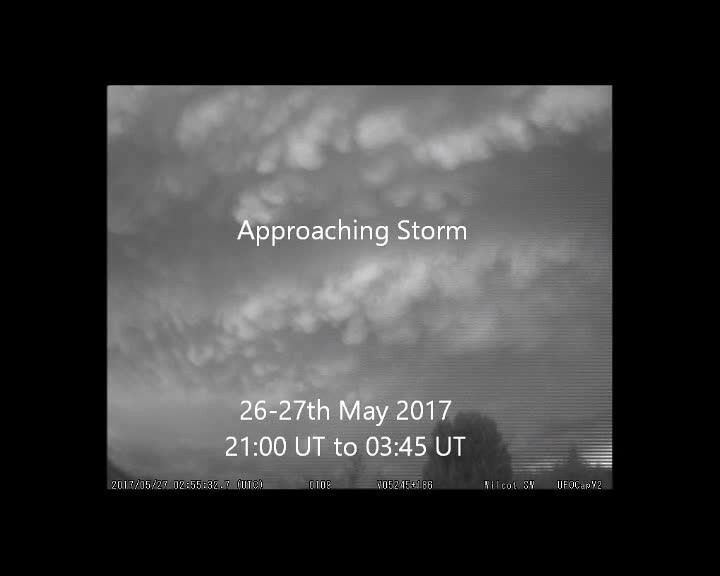 The storm commenced Saturday 27th May 2017 approx. 01:00 UT (02:00 BST) and lasted approx. two hours The two “stars” visible in the video are Spica on the left and Jupiter (brighter) on the right.